Keith Bradley has received an honorary degree from the University of Bath in recognition of his distinguished career in architectural practice. 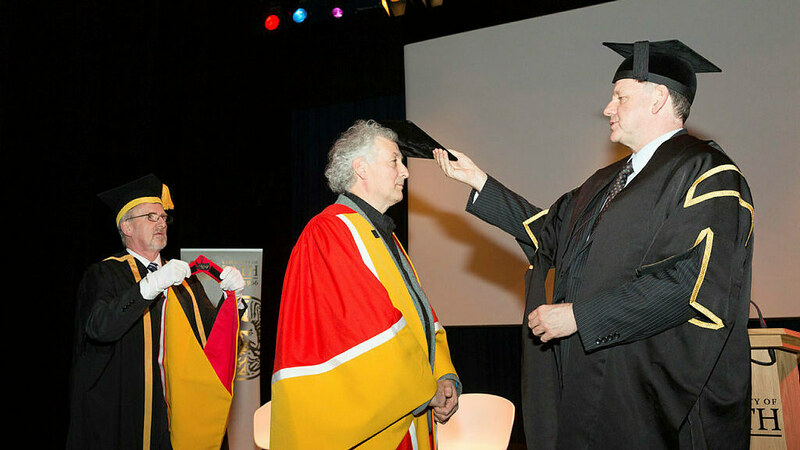 Mr Keith Bradley receives an honorary degree, conferred upon him by Deputy Vice-Chancellor Professor Bernie Morley. Keith has led numerous Feilden Clegg Bradley Studios projects including over 40 that have received RIBA Awards, along with Civic Trust, Housing and Sustainability Awards. He led the 2008 RIBA Stirling Prize winning Accordia Housing Project in Cambridge, and has worked on urban residential, regeneration and masterplanning schemes in London and throughout the UK. He is a Senior Partner with Feilden Clegg Bradley Studios, based in London and Bath. Having joined the practice in 1987, he was made a Partner in 1995 and Senior Partner in 1997, and in 1998 he set up the London office. Keith is currently leading the design for a major new £165 million urban campus for Ulster University in Belfast. He is a guest critic and lecturer at a number of Schools of Architecture in the UK, including the University of Bath, and a frequent speaker at conferences in the UK and abroad. Keith began his career as a student, studying architecture at the University of Bath from 1976 to 1983. After graduating, he worked for Cambridge Design and for Nealon Tanner, before returning to Bath in 1987 to join The Feilden Clegg Design Partnership. His ability and achievements were recognised in 1997, when he became a Senior Partner and with the renaming of the practice as Feilden Clegg Bradley Studios. Keith has led the practice in producing some of its finest architectural achievements. In 1991 he was responsible for the Bridgemead elderly care hostel in Bath, which won the practice its first RIBA award. During the following twenty-five years, he has led many more award-winning design teams across a wide range of projects. These include Accordia, the housing scheme in Cambridge that won the 2008 RIBA Stirling Prize, the UK’s foremost prize for architectural excellence. Keith has gone onto lead the workload of his practice in other areas. Three buildings for Manchester Metropolitan University helped to transform their estate in central Manchester. These projects included the Manchester School of Art, which was short-listed for the Stirling Prize in 2014, and the MMU Business School & Teaching Building, which won the Prime Minister’s Award for Best Public Building in 2009.